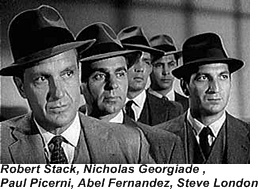 Special Agent Eliot Ness and his elite team of agents battle organized crime in 1930s Chicago. during Prohibition. Ness was a federal Revenue Agent bent on ending organized crime’s lucrative alcohol distribution business. 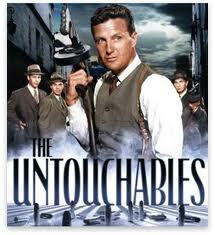 His hand picked squad of agents was nicknamed “The Untouchables” because of their incorruptibility. the show was forced to make some changes including expanding the role of the character Nick Rossi who was the only Italian/American agent on Ness’s squad. The series was panned for what critics at the time deemed “excessive and senseless violence” yet public loved the action. Walter Winchel in 1972 at 74 of prostate cancer. 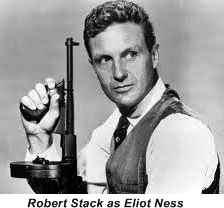 Van Johnson was originally slated to play Eliot Ness, but he backed out the weekend before filming was to start in a dispute over money. 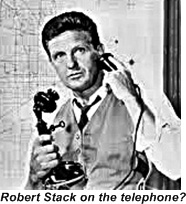 Robert Stack was hastily recruited on Sunday morning fitted for costumes that afternoon, and started filming the next morning. Edward Asner, Martin Balsam, William Bendix, Charles Bronson, Victor Buono, James Caan, Dyan Cannon, Mike Connors, Robert Duvall, Peter Falk, Anne Francis, Richard Jaeckel, Robert Karnes, Jack Klugman, Martin Landau, Cloris Leachman, Jack Lord, Lee Marvin, Gavin MacLeod, Ricardo Montalbán, Elizabeth Montgomery, Patricia Neal, Leslie Nielsen, Leonard Nimoy, Carroll O’Connor, Gregg Palmer, Robert Redford, Cliff Robertson, Telly Savalas, Barbara Stanwyck, Jan Sterling, Suzanne Storrs, Roy Thinnes, Claire Trevor, Lee Van Cleef, Jack Warden, Steven Hill and others.